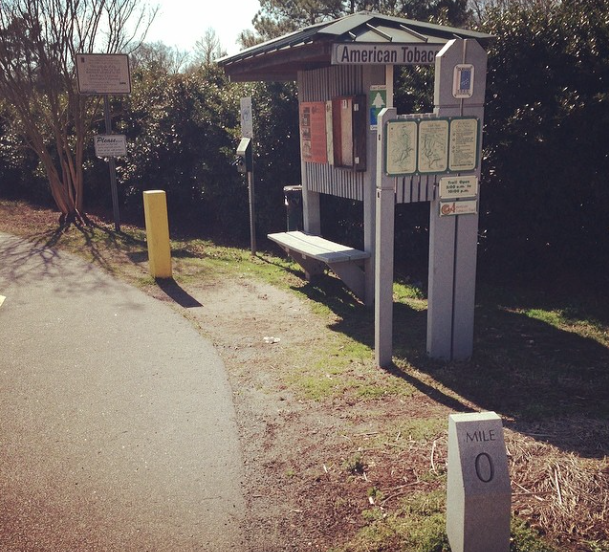 The American Tobacco Trail has been a great place to run (and bike) in the Triangle for 10 years now. For the past year or so, I, and many others, have been very anxious about the opening of the bridge over I-40. This was the final piece of the puzzle, which would connect the 22 mile marked stretch from Apex/New Hill to downtown Durham. Once they announced the bridge was complete (on February 21, 2014), I began to plan my journey. There really wasn't a whole lot to it. The week before, I ran the Black Mountain Marathon with my dad, and despite some knee pain, knew I was fit for the task. So come around 10am on Saturday, March 1, 2014, I was ready. 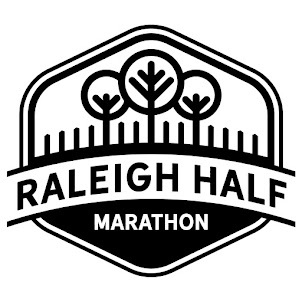 I would run from mile 0 in Apex to mile 22 in downtown Durham, then keep on going another mile to Fullsteam, for a celebratory beer or two. I drove from my home in Five Points out to the 1309 New Hill-Olive Chapel Road entrance of the ATT and parked on the gravel lot, loaded up my gear (with electronics/toiletries/etc in ziplocks), and began my journey. The first 5.4 miles were pretty straightforward, with double track crushed gravel trail and some minor undulations. As planned, some friends of mine had left me two 12 ounce Gatorades at the 1205 White Oak Church Road entrance. That would be my first short stop. I chugged one, packed the other, and continued on. I would take my first gel at around 10 miles. Luckily, I had my handheld bottle to take it with, since the water fountain at around mile 9 wasn't working (due to winter). This was the point that I began to cover some ground that I had not been on before. I passed the USA Baseball complex at around 11-12 miles and then continued on towards Southpoint Mall. This is where it got a little bit tricky. I curled around behind the movie theater and at around mile 14/15, finally passed over the bridge on I-40. I'm not gonna lie, it was shaking a little. I'm not great with heights, so I was happy to get to the other side. Once I got off said bridge, there were some odd turns. 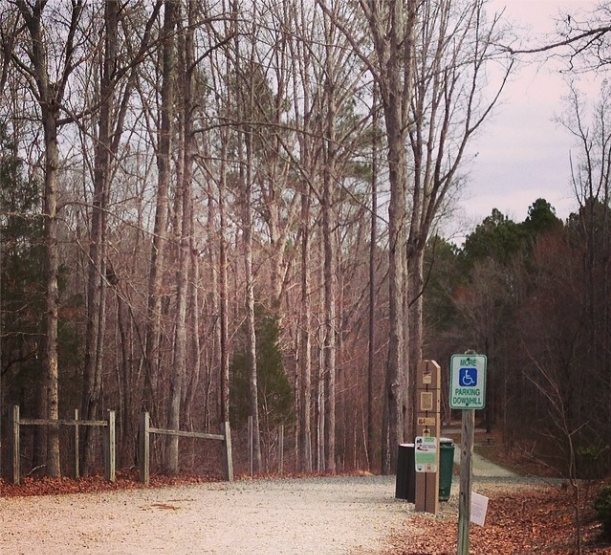 I was happy others were on the trail, because the zig zag by the apartment complex at the shopping center where Bull City Running was would have thrown me for a loop. Luckily, fellow runners led the way, and it was somewhat chalked out with directions as to where to go. The biggest difference in the Cary/Apex part of the ATT and the Durham section is that the Durham section is paved, whereas the Cary/Apex section is crushed gravel. I've been battling runner's knee for a month, so this took some getting used to. 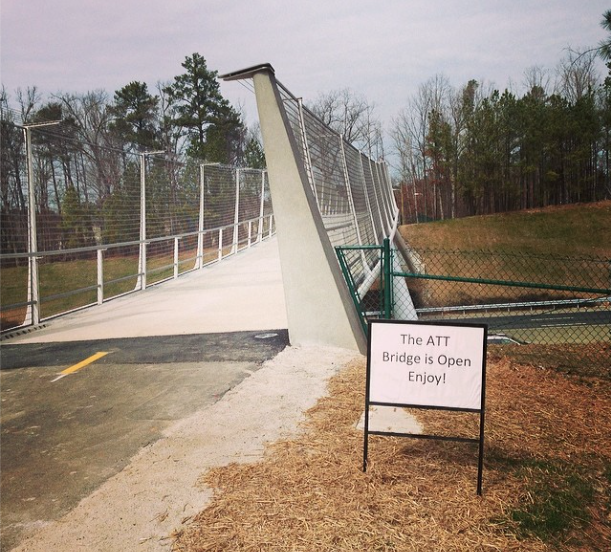 The ATT is very well marked in the Durham portion, with painted markers every quarter mile. I began to use these as a countdown as my hamstrings began to bark and I could taste that beer at the finish. I popped in a gas station right along the trail to refill my water, and then I hit the homestretch. The last few miles took me through some of the dicier areas of the trail, but at 6', 185, I don't worry too much about that, especially in broad daylight. Everyone I ran into this day was very nice. I passed the last small bridge with a quarter mile left and hit the mile 0 in Durham marker. Sweet relief. 22 miles in the can and one more to go. Mile 0 of the Durham section of the trail is on Blackwell Street, so at this point, I just went straight. I went about 3/4 of a mile before turning right on Hunt Street, and then had just a quick left on Rigsbee Avenue. I had made it to Fullsteam. 23.03 miles from the parking lot in Apex to the front door of one of my favorite breweries. It was an absolutely beautiful day in Durham and I was able to enjoy a Carver and a Workingman's Lunch, as well as a delicious Reuben from Sympathy for the Deli (and a Coke. Real Coke, not diet). 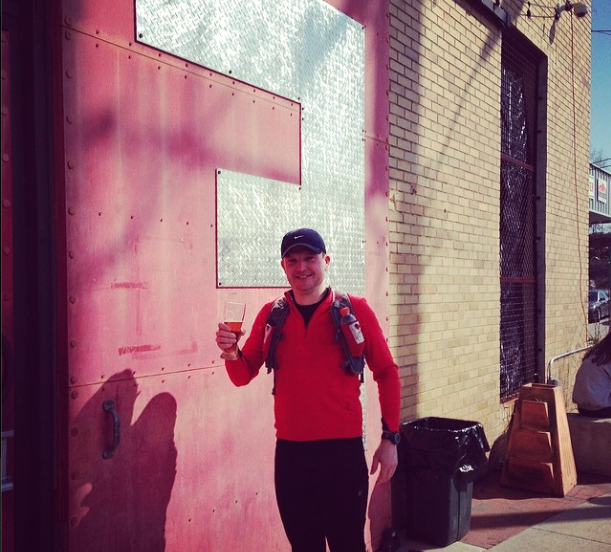 A beer to finish the run! There is a "2.0" model, but I have the original. Great for carrying everything you need. Very light and fits nice and snug. I do not use the Ultimate Direction bottles supplied. I find the 12 ounce Gatorade bottles fit better in the pouches. My favorite handheld, because you don't really notice it. Only holds 10 ounces, but easy to carry and refill. I took two. Probably could have carried one more. I like the Kona Punch, Vanilla and Strawberry flavors. If you're tired, the caffeinated flavors are great too. With all the injuries I've had in the past 4 years, Hokas are great. Lots of cushioning. Still responsive. Garmin Forerunner 110, iPhone, iPhone charger, Sony MP3 Player, Body Glide, Ibuprofen, Salon Pas, Paper towel. 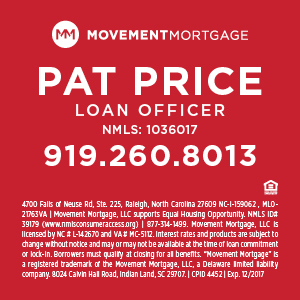 Thinking of buying near the ATT? I can help! Tomorrow morning, I'll head to Des Moines for the 2013 USA Outdoor Track and Field Championships. 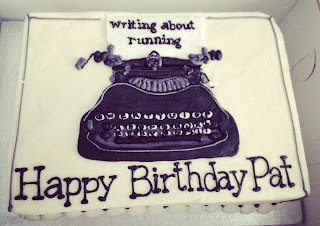 I'll be tweeting as usual @writingaboutrun, putting some photos up on instagram and reporting for the Daily Relay. If you have any Des Moines tips, please send them my way! Make sure and bookmark the Daily Relay's 2013 USA Outdoors page for up-to-date everything! 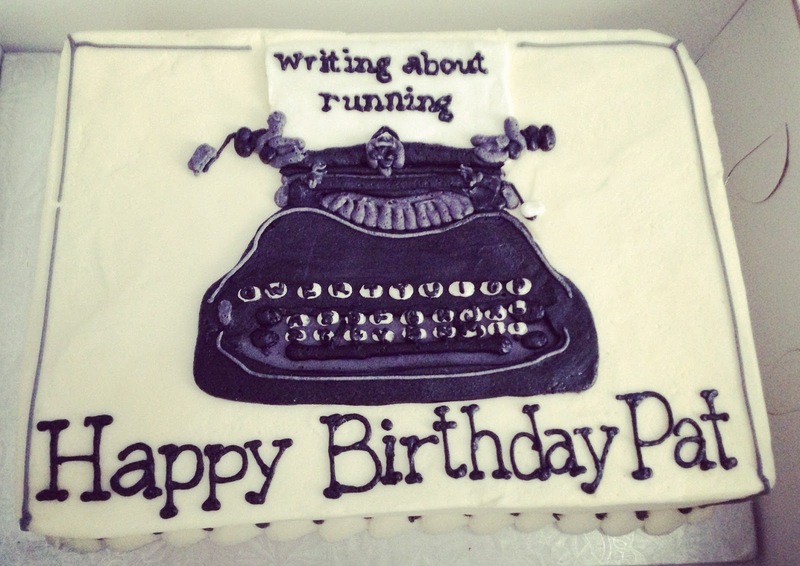 Birthday was six months ago, but that's a sweet cake, right? Hey folks! It's been a little while since I posted here. Thanks for following me over to the Daily Relay. 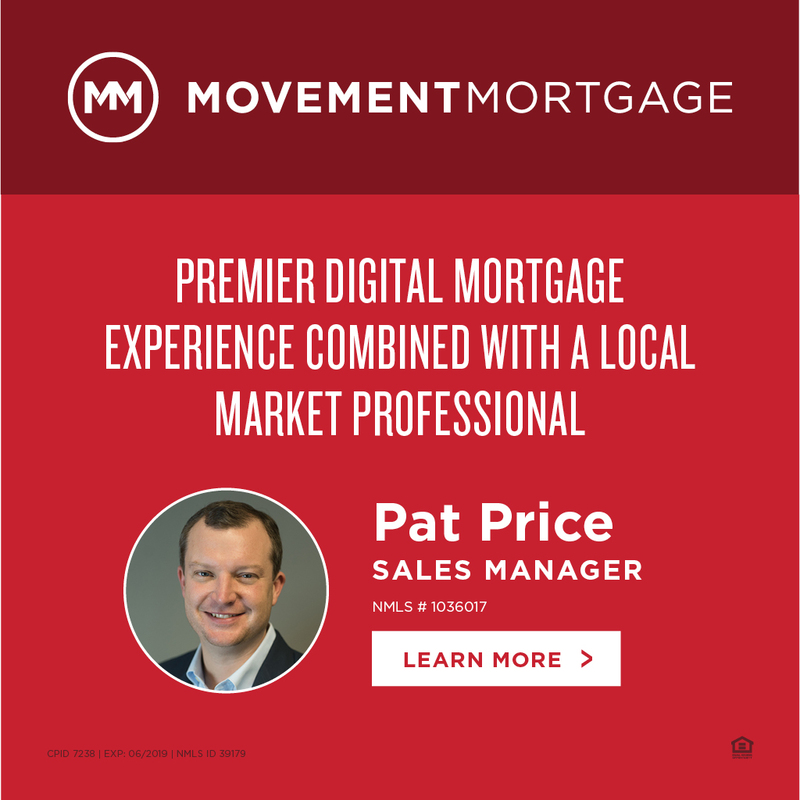 Over the past six weeks, I've enjoyed contributing two articles a week to what is becoming an excellent site. I was also a little too close to the situation in the recent shooting at George Bush Intercontinental Airport. This and the grind of flying twice a week for the past 2.5 years has helped me make the decision to get off the road! Oh yeah, and later this year (or early next), I plan to tackle a 50 miler to try and qualify for the Western States 100 Mile Endurance Run. It's real if I put it online, so I'm gonna go for it. Injuries have plagued me, but I can run slow for a long time, without too much pain! What's on my upcoming schedule? 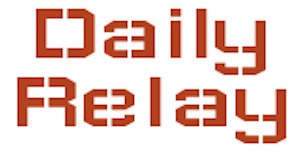 I'd like to introduce a new site that I am involved in, the Daily Relay. 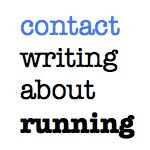 The Daily Relay will provide similar content to what has been here at Writing About Running, but it will be more consistent (daily posts) and will have a great group of writers involved. I'll be the contributing editor to The Mixed Zone, which will be a take on the entertainment side of Track and Field. I'll also be the contributing editor to 5 Questions, a section similar to the 5QW here at WAR. Want a link to my first post? Sure, why not. 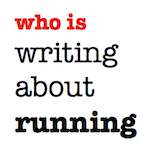 It's entitled "5 Reasons the Boston Marathon is similar to The Masters (and 5 reasons it’s different)"
If you have any questions, feel free to email or tweet at me! Future stars emerge every winter during the indoor season. Some continue to blossom during outdoors and some run out of steam. What will this year's class do? We'll likely find out at some early season meets like Raleigh Relays, Stanford Invitational and Mt. Sac Relays. The ultimate goal for these athletes will be a strong performance at USATF Outdoors June 20-23 at Drake Stadium in Des Moines, IA, with hopes of qualifying for the IAAF World Championships August 10-18 in Moscow. 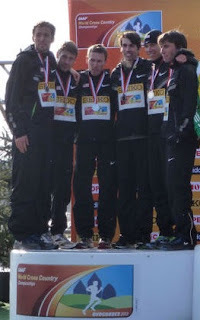 Who attain the World Championship A-Standards and who will emerge and don the Team USA kit come August? 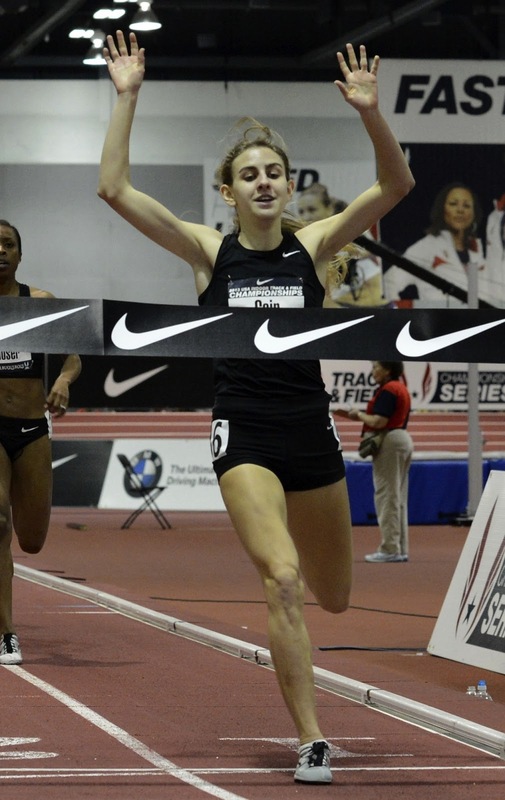 Notable 2013 achievements: USATF Indoor Mile Champ (5:05.68 - 58.61 final 400). American High School Indoor Two Mile Record at Boston Grand Prix (9:38.68). American High School Indoor Mile Record at Millrose Games (4:28.25). Thoughts: What more needs to be said? Best season ever for a female high school runner. We'll see if she can keep progressing outdoors, get the A-Standard of 4:05.50, and compete with the likes of Morgan Uceny, Jenny Simpson and Shannon Rowbury. Notable 2013 achievements: USATF Indoor 800 Champ (2:02.64). World Junior 600 Record (1:26.45). Thoughts: Wilson passed on Florida State after setting the 600 World Junior Record (for the first time. She should compete for a spot on the Moscow World Championship team this summer, but will need to run the A-Standard of 2:00.00 to be considered. 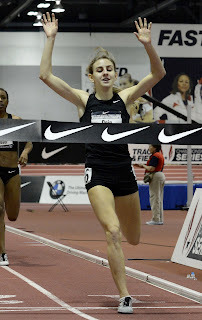 Previous achievements: 2012 NCAA Outdoor 5000 Champ. 5th at 2012 Olympic Trials 5000 (15:19.98). 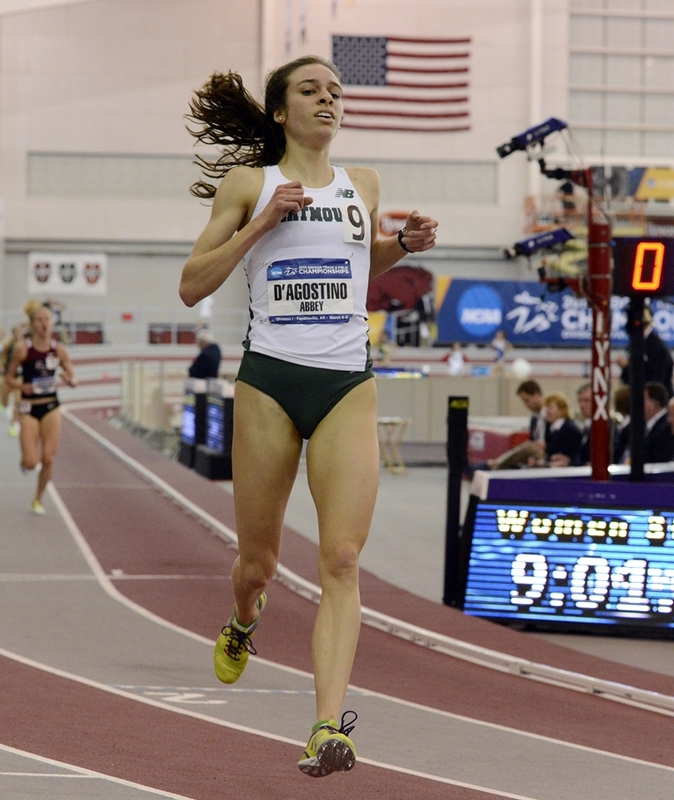 Notable 2013 achievements: NCAA Indoor Champ at 3000 (9.01.08) and 5000 (15:28.11). Thoughts: D'Agostino is the most accomplished of the bunch here, with a National Championship already under her wing. But the way she dominated indoors shows her development. She'll look to defend her outdoor 5000 title and compete for a spot on the World team this summer, as the 15:18.00 A-Standard is just off her outdoor personal best. Thoughts: Reilly ran a few excellent races this winter and capped it off with her first national championship on the track. She should compete for a spot on the 10,000 team for Moscow, but will need to run 31:45.00 likely at Stanford to be in contention. Previous achievements: 2:01.63 Personal Best in 800. 4:10.57 Personal Best in 1500. Thoughts: Grace is quickly progressing. I'm not sure what her best distance will be, but she should have a breakout outdoor season, even if qualifying for Worlds may be a more distant goal. Previous achievements: 2nd at 2012 NCAA Outdoor in PR of 1:45.60 (to Charles Jock). 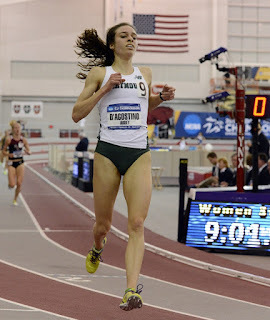 3rd at 2013 NCAA Indoor 800. Semi-finalist at 2012 Olympic Trials. 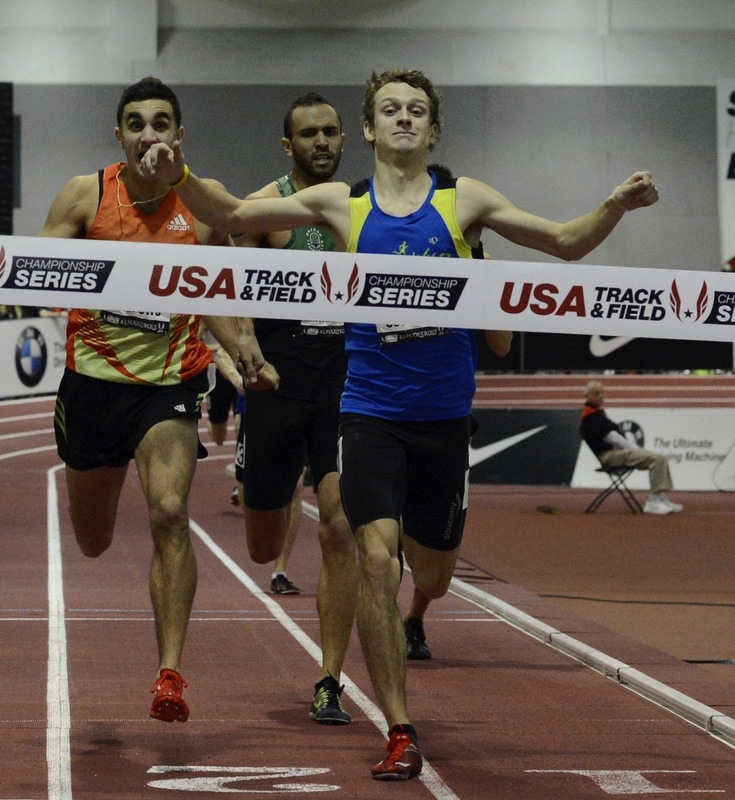 Notable 2013 achievements: USATF Indoor 800 Champ (1:47.09) over Robby Andrews, Tyler Mulder and Matt Centrowitz. 600 American Record (1:15.61) at Millrose Games over Duane Solomon and Nick Symmonds. Thoughts: 2013 has been a true breakout year for Sowinski and he'll hope to carry that momentum outdoors. The A-Standard for the 800 is 1:45.30, just off his personal best. He'll likely need a second faster than that to make Team USA. Previous achievements: 4th at 2008 Olympic Trials 1500. 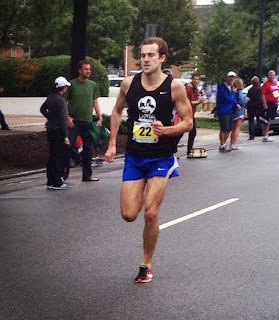 3:36.33 Personal Best in 1500.
Notable 2013 achievements: USATF Indoor Champ at Mile (3:58.79) and 3000 (8:07.84). Thoughts: Leer has always been a racer, yet he has never hit a World A-Standard. He'll need to run 3:35.00 early to be ready to fight for a spot on the always tough 1500 team. If he can get that out of the way, I like his chances at the USATF Outdoor Final. 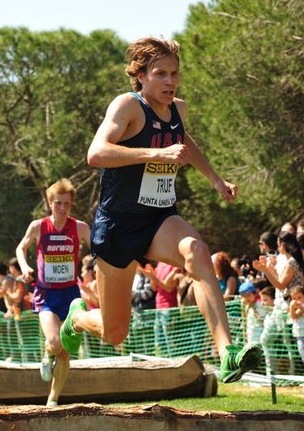 Notable 2013 achievements: NCAA Indoor Runner-up at Mile (3:55.25). 6th at Millrose Games (3:54.89). Thoughts: Hill has shown some serious speed this winter. He'll need to run the A-Standard of 13:15.00 to be in contention for a spot on the Worlds team, but has improved steadily every year and has phenomenal closing speed. He'll look to battle Kennedy Kithuka and Lawi Lalang over 5000 for an NCAA Championship this outdoor season as well. Previous achievements: 1:45.06 Personal Best in 800. 2012 Olympic Trials 800 Finalist. Notable 2013 achievements: NCAA Indoor Champ at 800 (1:47.13). Thoughts: Greer continues to get better and will compete for a spot on Team USA. He'd love to win an NCAA Outdoor title in the proceess. Notable 2013 achievements: Fastest American time ever at 600 (1:15.42 - Oversized Track). NCAA Indoor Runner-up at 800. Thoughts: The knock on Loxsom has always been his inability to make and run well in championship finals. He looks to have overcome that dig this winter with his runner-up finish at NCAA's. He'll look to build on that this spring as he has the best "true speed" out of any of the top American 800 guys right now (save maybe Solomon and Jock).